After successful launch of rooftop solar panel at railway stations, the Railways is now making efforts to install the solar power panels on train. Railways has proposed to set up the roof top solar panels on Bhopal Express and Rewanchal Express. for the solar panels. Lights, fan and other electricity facility to the passengers will be supplying in the train through these panels. Sources said Railways has also written letter to Renewable Energy Department for purchasing electricity from the solar power plant park being set up at Neemuch, Agar and Shajapur. Sources said there is also a plan to set up solar power plant in Bina and Itarsi in collaboration with a private company. Railway officials and the company representatives have already identified area in Bina to set up 1000 mega watt power plant. A source said at present Railways is purchasing electricity at a higher price. 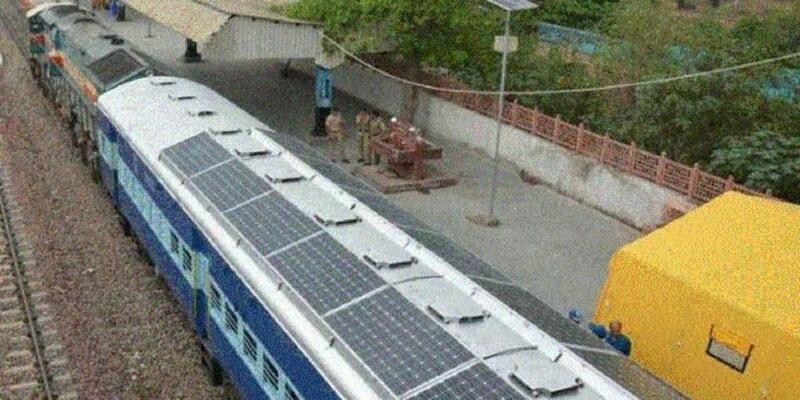 Concerned over the expenditure on electricity, Railways has planned to use solar power for train. If all goes well, Bina and Itarsi would have the solar power plant to provide electricity to all stations and trains under Bhopal division. A private company has been given responsibility to set up the power plant. Railway is providing space to the company and all expenses of equipment, machinery, labours, etc would be from the company. The company will be providing electricity to the railway at cheaper cost. Railway officials said that it would require about 7 acres of land to set up the plant. Electricity produced with the solar power plant will be used for daily task at railway stations and railway colonies. Remaining electricity will be used for running train after connecting the Overhead Electric Line (OHL) with grids. At present, the solar power plant set up at Bhopal railway station is producing 750 mega watt electricity. The electricity produced in this plant is being used in railway officers and staff colonies. According to sources apart from Bina and Itarsi, solar power plant is also being set up at Shajapur, Neemuch and Agar where about 1500 mega watt electricity will be produced. Railways has written letter to Renewable Energy Department purchase the electricity from this plant. The department would be providing about 207 mega watt electricity to railway from these three plants. However, Renewable Energy Department is yet to decide over the unit of electricity for railway. Officials said that identification of land has been done in the areas for setting up the solar power plant and by year 2019, construction work would be started. The plants would also be providing electricity to the metro rail proposed to be run in Bhopal and Indore. Metro train will require about 3,000 million unit of electricity which will be produced there in Shajapur, Neemuch and Agar. The solar parks will be set up by Rewa Ultra Mega Solar Limited. Bhai lage haath Rewa bhi band karwa dena, humlog Satna se trains pakad lenge. Afterall ham insaan toh hai hi nahi, we don't deserve dedicated trains. Trains toh bas Tainagar 'Indore' aur Ratlam ko milni chahiye because "Asli Travelers" are from there only. Please close down Rewa Station and extend Rewa Nagpur, Rewa ANVT Express, Rewa Rajkot Express etc. to Indore and Ratlam.